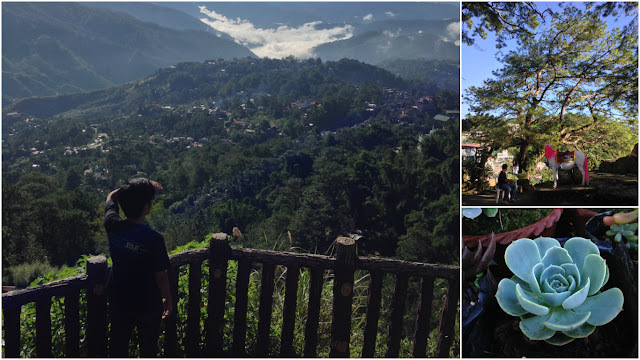 Baguio is synonymous to so many things: Pine trees, Summer Capital of the Philippines, strawberry taho and yes the place where broken hearted people escape thanks to that Angelica-JM movie. I may or may not have liked that movie, and it wasn't the movie that lead me this far off North. It is safe to say that I had a mental crisis and I needed to fix it - fast! Woke up pretty early, took a bath, dressed up and packed an overnight bag and hopped on a bus. There's something with Baguio that makes the long travel truly worth it. How every mile we drove away, the more things became clear to me. I found peace from looking out into the passing buildings. Did I felt a sense of freedom that I was not bound to anything - no responsibilities, ergo no problems? I threw adulting out the window when I boarded the bus. It was reckless sure, it was out of character and I told myself that I needed this. In between tears and laughter, I made it unscathed - barely. Baguio is utterly enchanting. Mountains of verdant lands stretch as far as the eyes can see. The cold breeze crisp and clean, a relief from the overly polluted Manila air. I felt rather small in this huge place, towering pine trees with dew drops and happy smiling people willing to help someone who looked rather lost. With only 48 hours to spend, I had set a plan to visit as many places as my energy, my shoes and my money will take me. There were 3 things I was sure to do: explore, eat and ukay! That is in no chronological order. First, Mines View Park with the help of Google Maps and amazingly hospitable locals, I reached Mine's View pretty early. When I arrived, there were little tourists comparing to when I left the place at around 9AM. Mines View Park is just a brief jeepney trip away from Session Road. You have arrived when you see a throng of pasalubong centers and a huge gate with the sign. Entrance is free. 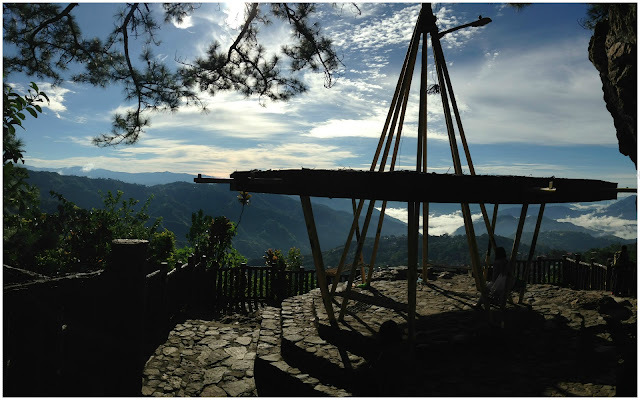 At the observation deck, unfolding your eyes is the panoramic view of Benguet's gold and copper mines. Take time for the vastness to sink in. It's just amazing how the world is with all it's wonders. How every breath I took was healing me in the process. Other than the deck, you will actually get the chance to take a photo with the same German Shepherd your friend posted in social media. For Php100 you get unlimited photos and props to boot. If allergic or scared of dogs, opt for a dog-free activity like: wearing native clothes and ride a pink horse for a fee. On my way out, since they also sell potted plants upfront, I got myself a Juniper plant for Php50. Constructed at the instance of William Cameron Forbes following the design of William E. Parsons, as part of the Burnham Plan for Baguio, 1908. This building is inspired by the City Beautiful Movement, the venue of the special session of the second Philippine Legislature, 1910. The Mansion was destroyed during the war, 1945 and rehabilitated on 1947. It was the venue of the UN Economic Commission of Asia and the Far East (ECAFE), 1947; The UN Food and Agriculture Organization (FAO), 1948 and the First Meeting of the Southeast Asian Union (SEAU) known as the Baguio Conference of 1950. Summer residence of American Governors-General 1908-1935 and later of Philippine Presidents from Manuel L Quezon to the present. Entrance is unfortunately prohibited but you can check out the gate whilst eating strawberry taho. The Mansion's elaborate main gate is said to be a replica of that of London's Buckingham Palace. Outside the place, you can see peddlers selling random stuff: from strawberry taho which is a must to try, you can also find fruits and even leather belts. Wright Park is fronting the main gate of the Mansion and features a shallow elongated rectangular body of water known as "Pool of Pines". Best to walk with friends and also a great area for jogging. If you walk far enough to the gazebo you can see a wide stairway made of stones that descend to an area where ponies are rented out. Thinking to myself now, this is the perfect place to hatch those eggs from Pokemon Go. Yeah, I play that too. Since Camp John Hay was rather far from Wright Park, decided to take a cab. Hailing a taxi to Camp John Hay was the best decision I have made on this trip. Not only was it a steep trek up but it was inaccessible to any form of transportation other than cab or private vehicles. Camp John Hay is a 690-hectare property which was turned over to the Philippine government in July 1st, 1991. The space has a 5,330 yard, 18 hole, par 68 golf course which is the best in the country. Around the complex are beautiful gardens, picnic areas, parks, an amphitheater and hiking winding through the hills with pine trees all over. Being there, made me feel one with nature. I kid you not, the air was crisp, clean and was it a bit chilly amidst the time. You can bring food along with you and eat at the tables or at the picnic area. Inside the huge space, there's a Negativity Cemetery which was rather interesting, a small museum and a gazebo which was featured on an ABS-CBN show. NEGATIVISM is man's greatest self imposed inflection, his most limiting factor, his heaviest burden. No more for here is buried the world's negativism for all time. Those who rest here have died not in vain - but for you a stern reminder. -- as you leave this hill remember that the rest of your life. Have a good day - Treat today like it's your last though it's the first of the rest. Oh Baguio, you make me want to come back. I heard a lot of creepy stories about the Mansion in that city. Would it be true or not?